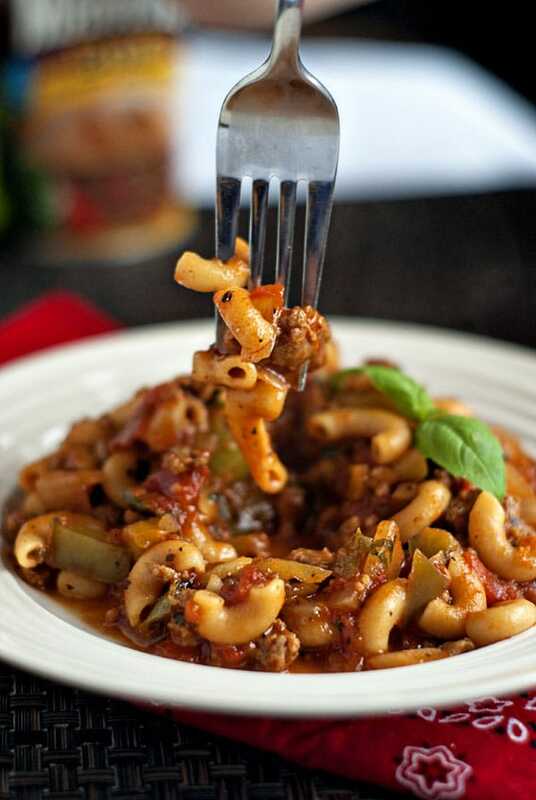 I’m kind of in love with the word “goulash”. Just saying it takes me to my grandma’s kitchen and floods my mind with the smells and memories it holds. It’s funny though because I can only remember her making it once while on a camping trip in her little camper trailer. I stood there, probably covered head-to-toe in soot, and watched as she cut the green peppers and onions. The fact that I was undeniably filthy didn’t phase her. She still asked for my help stirring and tasting until it was perfected. We laughed, we ate, and spent hours together laughing, singing, and playing around the campfire. I always long for the summer time because it means the camping trips are coming. It’s a chance to turn off the world and just have fun exploring, being together as a family, and enjoying each other. Wouldn’t it be nice if we could do this with our family at least once a week and give ourselves a chance to re-charge and prepare for whatever life throws at us? I’ve recently teamed up with Manwich for their “Case of the Mandays” campaign. Our goal is to help families spend more quality time together by turning our Mondays into “Mandays”. 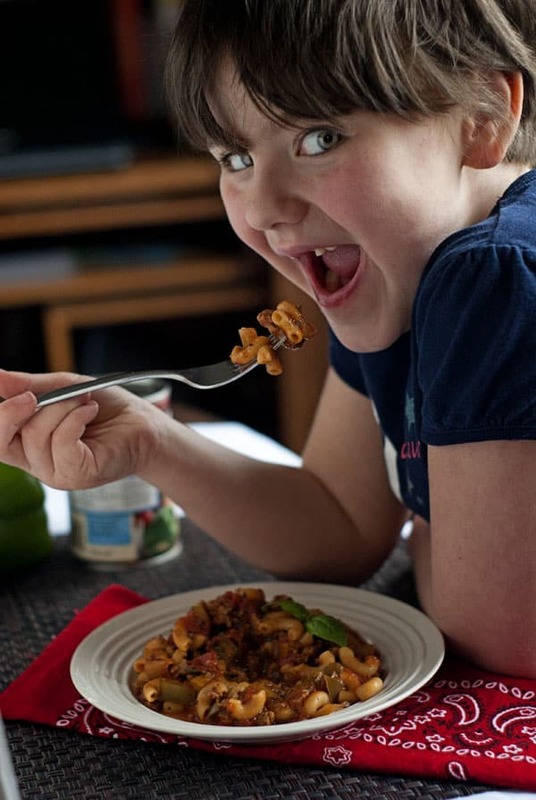 Their sweet and tangy tomato sauce is something that kids love and makes meal prep a snap, bringing the attention back to mealtime and away from everyday distractions. In all honesty it wasn’t until talking with the other bloggers working on this that I realized how versatile Manwich really is. 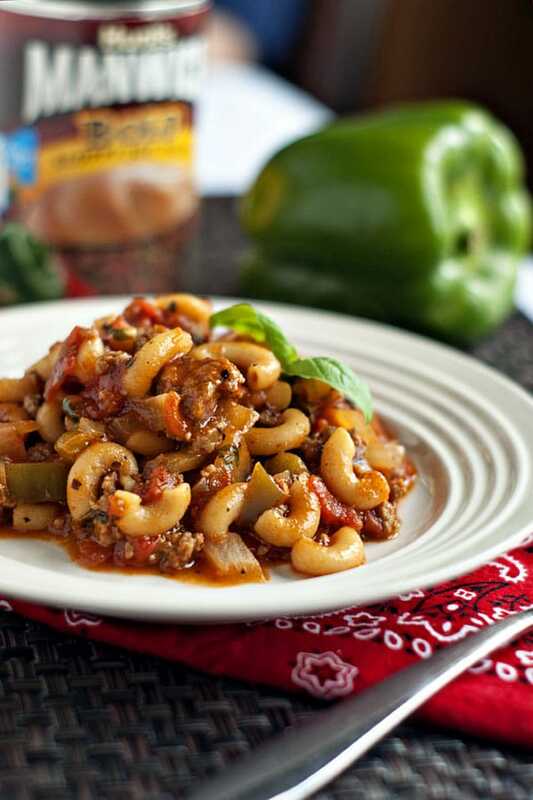 It’s a great way to add tons of flavor for quick and easy meals. 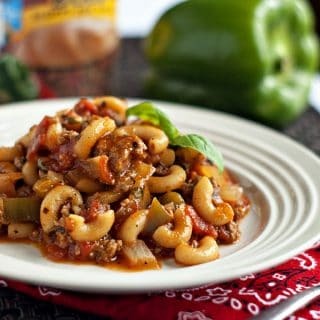 So today I decided to take a basic goulash and give it a Manwich twist. It’s chock full of Italian turkey sausage, tomatoes, pasta, veggies and is filling and satisfying. It comes together quickly and is a great one-pot meal so you have more time to spend with your family. 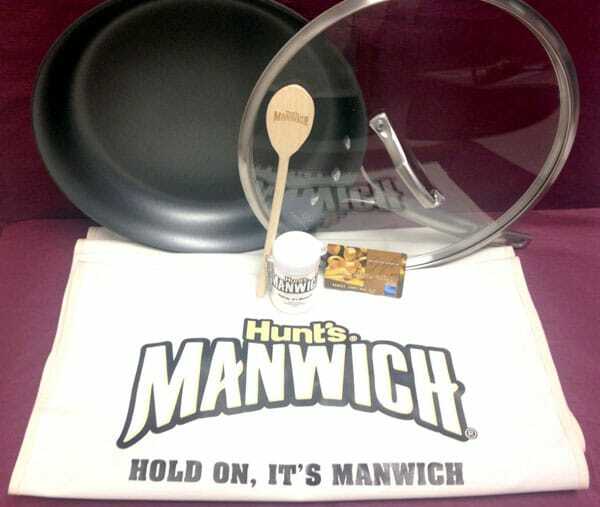 Manwich also wants to give one of you an awesome “Manday Survival Kit”! A $140 value! Enter for a chance to win at the end of this post. Brown and crumble turkey sausage in a large soup pot on the stove top over medium heat. Remove cooked sausage from the pot and set aside. Place onion and pepper in the pot and cook until softened, about 4 minutes. Stir in tomatoes, Manwich BOLD, water, spices and seasonings (except for the fresh basil), and soy sauce. Bring to a simmer. Stir in elbow macaroni, cover and let cook for 20 minutes or until the pasta is tender. Remove from the heat and allow to rest 10 minutes before serving to thicken. There are 4 kids,2 parents, and a grandmother. We eat dinner together at least 5 days a week. On a fixed income, we do this instead of going out. Thank you for this opportunity. Your daughter is a dead ringer for my daughter! Crazy! Made the sweet and smokey goulash for dinner tonight. Pretty good! Have some ideas on making more to the liking of my family but this is a good base. A little too spicy/saucey for us. Might add corn and green beans. Of course that would almost be vegie soup, huh. Anyway, thanks for the recipie. Really liked it! MY Grandmother also made this same dish, but she didn’t have the Manwich, and hers tasted just fine without all that sugar and stuff. Just saying you can leave out the canned stuff and still have a great meal. We love dinner/talk time almost every evening. Especially the quick meals and this one can be made quickly! We like having family movie nights and occasionally going out to dinner to spend time together. Thanks for the chance to win! We cook together and then eat together. It sounds terrible, but we schedule family time so that we can ensure the kids are getting together (and alone) time with each parent. Our favorite things to do together are baking, crafting and having random dance parties. Thanks for the chance to win. I try and make dinner early so we can all sit down and enjoy ourselves for an hour or so. We love doing pizza and movie downstairs with the family! We like to watch good movies together.